You can change any habit, even addictions to substances, gambling or nail biting. This is the main message of the phenomenally good book, “The Power of Habit” by Charles Duhigg. 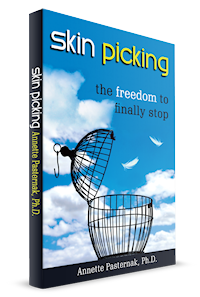 He doesn’t mention skin picking but you can change that too. According to Duhigg, every habit has a cue (also known as a trigger in the world of body-focused repetitive behaviors) that starts the habitual sequence of events, and a reward – something that feels good to you upon doing the behavior. It becomes a continually repeated cycle though, and upon repeating the cycle enough, you develop a craving: for the reward at first, but over time the craving occurs sooner, and you crave the behavior itself. As Duhigg explains, if you keep the cue to the habit the same and also keep the reward the same, then you can change the behavior between them, which is the actual habit you wish to break. What is the cue and what is the reward? The cue is what tells the brain to start the habit, an automatic behavior the brain has learned. To save energy and be more efficient, the brain runs well-learned behaviors on automatic. Beneficial examples are walking or driving. We don’t need to think about how to do those things at all anymore – we can have our attention occupied by our surroundings, our thoughts, a podcast or even a conversation. A cue can be a place, a time, an emotional or physical state, an activity, or a combination of those things. A reward is the immediate benefit you experience from the habit. We can keep the cue for our picking the same. We just need to be totally aware of all our cues in order to implement a new routine at the onset of the cue, rather than the picking. The reward is a bit trickier. You need to really consider: What is the reward for you? Is it a moment of escape from what you were doing, were about to do, or were contemplating doing? Is it the physical stimulation, and if so, on your fingers? Or on the part of your body that you’re picking at? Is it a feeling of accomplishment? A bit of fun? Some time alone? Relief from loneliness, boredom or sadness? These rewards are individual and vary from person to person. You need to figure it out. You may be able to pinpoint your rewards just by thinking about it. Your habit log might give you clues. Or you may need to experiment with different possible rewards and see which one works for you, figuring out which one provides you the same type of reward that can successfully replace the picking. Stephany realized that she liked the feeling under her fingernails, and she liked the sensation and satisfaction of getting something out of her skin. So she invented her own “fidget toy”: She mixed seed beads (the tiniest beads) into Crazy Aaron’s thinking putty, and she then picked them out one by one while she was watching television (one of her cues for picking). Stephany found that, because the reward was similar enough to the reward she got for picking, it satisfied the craving for picking. After using her bead putty, she did not have the urge to pick anymore. Sometimes a combination of rewards are at play. What worked for Kelly was to head to the bathroom after work, a cue for picking, but she replaced the picking behavior with dry brushing her arms and legs, followed by meridian tapping. She really enjoyed this 10 minutes of alone time right after work, and I helped her realize that the picking was providing her alone time she didn’t know she needed. The alone time to decompress from her hectic job was one reward for her, as was the physical stimulation that the dry brushing provided instead of the picking. Sometimes removing a cue entirely is important in wearing away at the deep groove of the continually traveled behavioral neural pathway. The bathroom was a cue for Kelly, but the immediate cue in the “loop within a loop” was seeing her face in the mirror. In her case it was also important to cover the lower part of the bathroom mirror, so she was only able to see her face from far away. 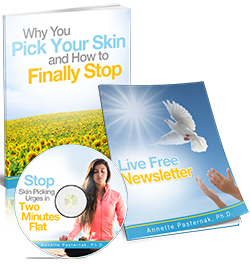 Both seeing and touching skin are the universal immediate cues to the habit nested within the larger habit loops. So one more thing to consider! On a side note: The habit of looking in closely at your skin will gradually wear away when not continually traveled, but it will take longer than you think. On your own you will always feel more in control than you really are, so I’m warning you: do not take that covering off the mirror for many months! And then at the first sign of the leaning-in behavior returning, re-cover the mirror. It may have been too soon, and it definitely needed to be repeated. There are more cues for picking, of course. Certain thoughts and emotions are big ones that I’m not going to address in this blog post. I do have chapters in my book about them, but they are some of the trickier areas for which it really helps to have some therapy or coaching. Additionally, as Duhigg makes clear when overcoming addictions, belief is a huge component of recovery. Belief and encouragement that it can be done, which by the way, I think is one of the main benefits of my coaching, whether it’s in a group or individual. Belief is needed to not give up when the going gets rough. Determine and list your cues. Figure out what replacement activities would give you rewards as similar as possible to the ones for picking. Implement. Experiment as needed, but do not give up! If you’re overwhelmed and already know you’re not going to make yourself do homework (it’s hard to hold ourselves accountable! ), contact me to learn how coaching can help you. Even better, schedule yourself a Breakthrough Session with me, now 75% OFF when you enter that as a coupon code: “75%OFF”.